Also, this con was the last appearance of my adopted Uncle George Perez until 2009! As usual, he again helped raise thousands of dollars for Make-A-Wish. His artwork for this year's T-Shirt brought in the most money at the charity art auction. He and his wife Carol Flynn celebrated their 25th wedding anniversary in 2006 and I drew them a New Teen Titans #8 cover tribute the issue he was working on when he had his first date with her. They own the original pencil and ink artwork, original color artwork, and 23 of the 25 signed and numbered prints that I also made for them. I own print #14, which is personalized to me, and I will not part with it! Print #13 sold for $210.00 at the auction and was also signed by my Uncle George. And I brought new drawings of Starfire, Raven and Wonder Girl [Donna Troy] for him as well. Since my adopted Uncle George Perez won't be at any other conventions until 2009, I asked him the following 100 fun, non-comic book questions at Pittsburgh Comicon for everyone to enjoy. Find out what his favorite television show, pizza topping and other things are, plus learn what song he'd sing on the Karaoke machine, if he were able. 1. LAYNE TOTH: What did you have for breakfast? GEORGE PEREZ: Just a banana. PEREZ: Something like an icy blue. 3. TOTH: What kind of shampoo do you use? PEREZ: I can't use any shampoo at all. 4. TOTH: Favorite TV show? 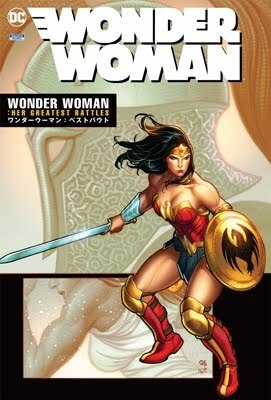 You might have heard the rumors and they are true - George Perez, the living legend, the man behind the definitive versions of Wonder Woman and the Teen Titans, has hung up his convention-going hat until 2009. At this past weekend's Pittsburgh Comicon, the convention promoters set aside some time, as they do every year, for George Perez to talk with fans and get some questions answered. This year was special, though, as Pittsburgh marked George's last official convention appearance in the United States, and one of the last two total, until 2009. Perez explained this at the beginning of his panel, noting that he's got one more commitment abroad before unpacking his convention bags for a while. The reason for his departure from the convention scene is twofold. While he loves meeting fans and getting feedback during his show visits, he's taking the time off to focus not only on his work, but his wife. Perez explained that for a number of years, his wife has been patient and put up with his focus on touring to show after show. Now she, with a new position in a touring dance troupe, will be the focus of his life, and he said he just wants to devote his time to her now, following her around the country and watching her perform while he continues his work for DC Comics. From the hit NBC series "Heroes" to the much-anticipated debut of "Spider-Man 3" in theaters next week, comic book icons have a seat at the table of both popular culture and big business. Only a philistine would doubt that the once-maligned comic book subculture has made the transition from the anonymity of mom's basement to the corporate boardroom. Comic books are hip and profitable. Artist George Perez, arguably one of the top five fan favorites of all time, is making the Pittsburgh Comicon his last convention appearance for a few years. Known for his linear style and intricate rendering of superhero battles, Perez made his biggest mark on DC Comics' "Crisis on Infinite Earth," the Marvel/DC crossover between the Avengers and the Justice League of America and a superb run on "The New Teen Titans" in the 1980s. This year's Pittsburgh Comicon, April 27 - 29, 2007 at the ExpoMart in Monroeville, Pennsylvania, is the twelfth installment of the annual show, a fan and creator favorite since its inception. George Pérez (The Brave and the Bold), Terry Moore (Strangers in Paradise),Gail Simone (Welcome to Tranquility), Adam Hughes (All-Star Wonder Woman), Michael Turner (Ultimate Wolverine), Ethan Van Sciver (Green Lantern), Michael Avon Oeming (Omega Flight), Scott McDaniel (Green Arrow) and Billy Tucci (Heroes for Hire) headline the wide array of comics guests which stretches from the Silver Age to the most recent cutting edge indy press comics. Additional media guests include Deep Space 9's Chase Masterson, Farscape's Wayne Pygram and Gigi Edgley, and others. For information on the show and to purchase tickets online, please visit www.pittsburghcomicon.com. Every year the Pittsburgh Comicon helps to raise thousands of dollars for charity. All of the items in the charity auction are donated by the talented professionals that come to the show each year. Take a look at some of the awesome artwork all ready donated this year! Comments: Hello Mr. Perez, just wanted to say i'm huge fan and look forward to you new project. Very said to see Pittsburgh comicon your last north american stop for the next few years. On the bright side, i've had the chance to meet you a few times there. I've been lucky enough to get a number of head sketches from you at the Pittsburgh comicon and was wondering if it is okay I put a request in for a full body. I know you don't do many of those but figured try and request it early. Not very picky at all...either batman or go old-school w/ a 70s character (i.e, Man-wolf) or some one like that. thanks! A host of great comic creators are making their way to the Pittsburgh Comicon in 2007. Each year the Pittsburgh Comicon pulls in some of the biggest, best, fan favorite celebrities from the worlds of Comics, TV and Film! From the Small Press exhibitors, and our infamous Artist Alley artists, to the big time Hollywood Stars. It&rsquos a FanBoy (or Girl) Heaven! Here is a look at who is coming to our next big show. This page is a complete list of all of our guests.